Barely cooked under a light robe of panko and herbs these New Brunswick oysters are a treat alongside sparkling wine and lively conversation. This year I resolve to eat more oysters, world class delicacies from my own (figurative) back yard. I grew up eating Malpeque oysters from PEI. In fact, some of my earliest memories of Christmastime are of the crate of Malpeque oysters appearing on the counter and my dad shucking them with such delight. I remember trying to eat one on the half shell when I was six but rejecting the boozie looking blob. (Slippery textures continue to challenge me.) I remember my twin brother letting the oyster slip off the shell and down his throat. Or so it seemed, until it reappeared, hoisted back up his throat like a catch on a hand line. My next memories are of eating my mom’s oyster casserole, an oyster Chesapeake for a crowd with more than 100 oysters, tirelessly shucked by my dad. It’s garlicky, and crispy on top and filled with barely cooked oysters. It’s my favourite part of the Christmas night meal and a Christmas tradition that I have missed only twice in my life. Up until five years ago I had no idea that deliciously distinct oysters were harvested in New Brunswick, although the industry has been around here for centuries. 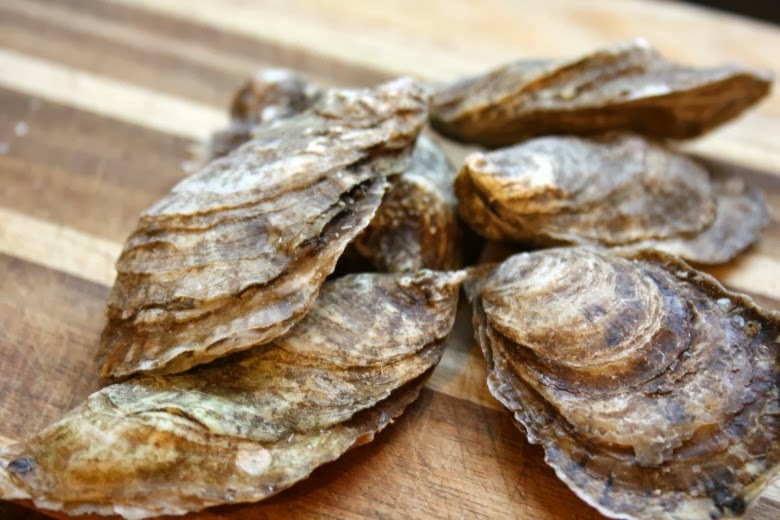 New Brunswick oysters are harvested along the Eastern shore, which is just across the Northumberland Straight from PEI, home to the famed Malpeque oysters. It was in Toronto of all places that I discovered Beausoleil Oysters. The host of a dinner I was invited to knew I was from New Brunswick so sourced local (for me) oysters. It was my first try with oysters on the half shell since the age six episode. Although I still have the texture challenge with raw oysters, I was thrilled to discover an industry right under my nose. My resolution: eat more oysters. As a starter they’re not an extravagance. Barely cooked under a light robe of panko and herbs they are a treat alongside sparkling wine and lively conversation. Or enjoy them briny-and-cold, raw on the half shell. At our local grocery store Beausoleil oysters sell for $1.29 each and are much cheaper if you buy a box (or a crate). I open my oysters in the oven, a trick I learned from my friend Laura. The bonus with this recipe is that a bit of the liquor evaporates so the panko mixture doesn’t go soggy. It’s also great for people like me who, as much as they might try, cannot manage a totally raw oyster. This is a variation of a recipe that Laura made for us last month and that I have made twice since. Place the oysters, cup side down (flat side up) on a cookie sheet. Place in the oven at 350 F for a few minutes until they open a crack. Watch them like a hawk because you don’t want them to cook too much. Remove from the oven, remove the top shell with the help of a knife and slice through the spot where the meat attaches to the shell. Combine the panko, parsley, oil and garlic in a small bowl. Sprinkle mixture lightly over each oyster and flash broil just until the panko starts to brown. Remove from the oven immediately. Green tip: Oysters are fantastic for the environment. They clean algae from the water so aquatic plants and animals get the oxygen they need to thrive. Here's more info that explains it. I absolutely love oysters and wish I lived by the ocean. As a prairie dweller, one of my resolutions for this challenge is to not eat sea food on the prairies. It just isn't fresh enough. G'day! GREAT project! Great resolution too! 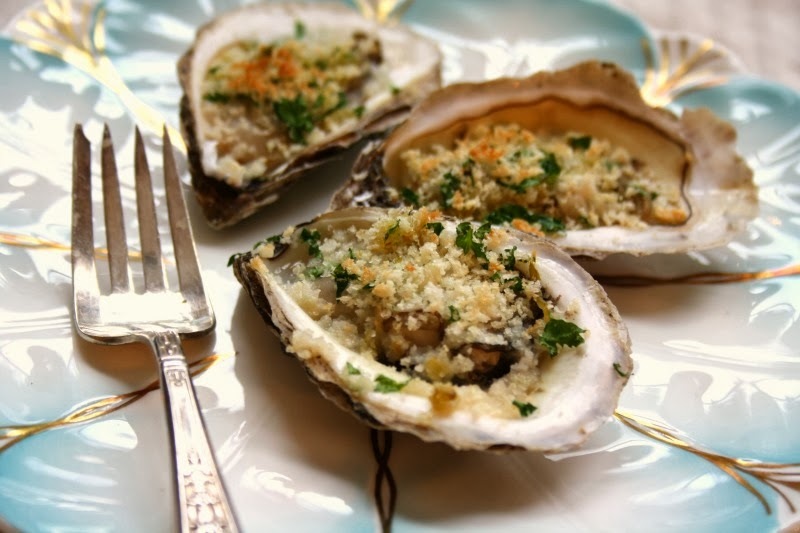 I LOVE oysters and love your recipe and photo today too! I'm totally jealous of your resolution! I have an oyster addiction but don't have them often, living in northern Alberta. I completely agree with Sarah's stance on the issue, actually. Be sure to eat a few for me this year, Bridget!